Fun idea! Little J has a poetry assignment each week at school, so maybe he would be up for a little more fun with it. What a great idea! We're going to try to do this. I have to look into all the links you gave in this post! We love poetry here, but illustrating... not so much. 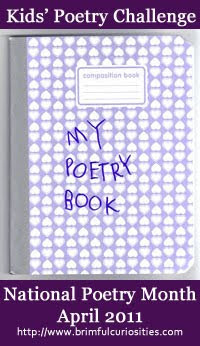 I promise to read lots of poems and join if we can. I want to do this, too - thanks for this and the advice about copyrighting! I'm going to try really, really, really hard to complete this challenge at least once this month. I am drowning in backlog in my reader and so sorry to have missed the first two weeks - but excited to join in for the second half of the month! 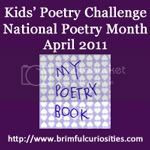 I'll be posting a poetry choice for Feed Me Books Friday this week - let's cross-link! BTW - fantastic list of links and resources here!